Jacqueline de Romilly was a renowned French classicist who died in 2010, though it doesn’t seem much of her work has been translated into English. I’ve only managed to find her Short History of Greek Literature, which covers Greek writing in all its forms from the eighth century BC (Homer) to the fourth century AD, that is, to the early Christian fathers and Julian the Apostate. The book is a little over 200 pages long and so de Romilly is only able to devote just a few pages each to the various authors and literary and philosophical movements that characterise this 1200-year period, and yet I can’t imagine that there are many, if any, better introductions to Greek literature. 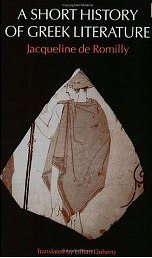 The book is particularly good when it comes to Thucydides and Plutarch and, in general, is a resounding defence of Hellenism, whose lifeblood de Romilly describes in her conclusion as consisting of: ‘inquiry and debate, political struggles and struggles over ideas, discoveries, effort, criticism and hope – all in search of the best possible life’.